St John has introduced a new scheduled week-day Health Shuttle services from Otaki to Palmerston North, to ease access to hospital. 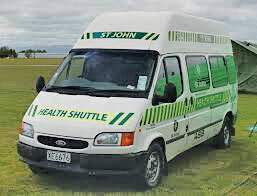 St John launched the Otaki Health Shuttle in June 2010. Straightforward and stress free, St John Health Shuttles offer transport strictly for people who need to attend health related appointments or treatment in Palmerston North. Many shuttle users are on their own or with health or mobility issues, and without the service would otherwise be unable to attend vital doctor, specialist and hospital or other health related care. “Up until now the service has operated based on individual requirements — leaving at pre-booked times throughout the day. Since then the number of people who have utilised the service has grown to the point that a scheduled service is required to ensure everyone’s needs could continue to be met,” St John Community Wellbeing Coordinator Andrew Baillie says. While requests for transport for medical appointments will continue to be on an as-required basis, he believes scheduled departures will assist local users to plan and coordinate appointments with health providers in Palmerston North. “People can continue to book the shuttle in the way they have in the past, but have confidence now that it will depart and return at set times throughout the day,” he explains. Health Shuttle users will continue to be collected from their homes or other locations they nominate and then be returned home after their appointments. “Apart from the scheduled times of departure from Otaki and Palmerston North nothing else has changed. When you have finished your appointment, the staff at your ward or clinic will contact the shuttle and confirm return times and departure points.” Mr Baillie says. Since its launch in 2010 the Otaki Health Shuttle, led by a team of dedicated volunteers has transported approximately 5,000 people for health related appointments, the majority of whom travel to Palmerston North.